← Breaking News from the O.G. Slumber Party Movie! For the love of Zombie Choreography! How could I post anything but Thriller on Halloween? This was groundbreaking stuff. Dancing Zombies, moving make-up, Vincent Price saying “y’alls”. It all started when The King of Pop went to see an American Werewolf in London and decided that he liked it and wanted his next video to resemble it. 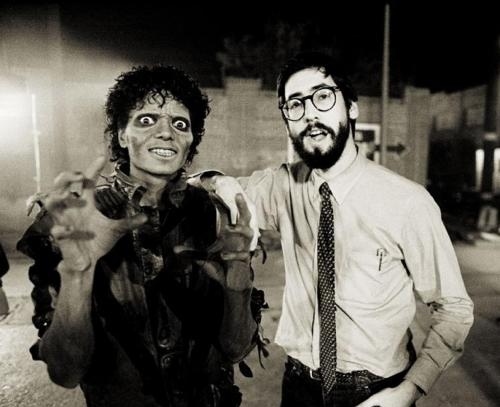 So he called up the director, John Landis, and asked him what he was doing. AWiL was groundbreaking itself because before 1981 movies did not actually show the werewolf transformation. You would see a guy acting like red hot hair follicles were about to burst out of his face, then he stepped behind a curtain or something and when stepped out, he was much hairier. Then he covered his face and screamed. This scared a passing squirrel so completely that the camera guy just had to cut away from the werewolf action to get a close-up of the horrified look on the little nut-nibbler’s furry little face. By the time he cut back, the terrifyingly hirsute transformation was complete, and the man-beast was celebrating with an arched-backed howl straight at the moon that started all this trouble to begin with. Landis saw this whole hide-and-seek werewolf thing as a big problemwhen it came to suspension of disbelief, so he created a new kind of Werewolf transformation make-up. If you know how a squib works…you’ve got a basic idea. I know what you kids are thinking…why didn’t they just use CGI? Because, youngster, there was no CGI in 1981. That’s right. And before Landis came along, we had to pretend that werewolf transformations didn’t look stupid, but they really did…especially what with the frightened squirrel thing…and we liked it. No. Wait. We didn’t like it. This entry was posted in Friday Morning Videos, halloween and tagged Halloween, Landis, movie effects, Thriller, werewolves. Bookmark the permalink. Still the best video EVER. We had a poster with all the zombies on it, and I had to have it removed from our room,because it was scaring me. Even though it was on a wall that was not visible from my bed. There were still THERE, man.